Did the Earth See Stars? It was once thought (amongst other hypotheses) that the moon was a great chunk of the earth ripped from the Atlantic Ocean. The latest fairy-tale is that a rock half the size of the earth crashed into it and the moon was the result – trillions of bits of debris forced into space and later joining to create the moon. Like so many parcels of information carefully crafted for us by unbelieving scientists, this latest fantasy is not worthwhile to ponder upon, unless you have a little time between filling the kettle and pouring yourself a coffee. Yet, one naive UK secular newspaper said “scientists have finally cracked one of the most enduring mysteries of nature – the origin of the moon.” Not quite, unless you are one of those ignorant Christians who try to juggle both the Bible’s plain language and evolutionary scientists’ fairy-stories, under the name of ‘Theistic Evolution’. The mythical collision between the massive rock half the size of the earth supposedly smashed it so hard that it “vapourised both parties”, which then “melted and mixed together to create a “volume of vapour 500 times bigger than the world today”. Yeah, right. The authors of this ‘scientific breakthrough’ said the bits sent into space finally crystallised into what we now call the moon. The team went even further with a scientific-sounding statement: “Our results provide the first evidence that the impact really did (largely) vaporise Earth.” This idea is based on the “identical isotope composition of the Earth and Moon”. Sounds good? Sounds final? Hm. As final as all the other hypotheses? In terms of science alone this is all guesswork. It is a retro-guess based not on known proven facts but on evolution hypothesis. There is no way of proving the rock hit the earth, or that debris finally formed the moon. It is all conjecture. I used to teach my students the difference between ‘evidence’ and ‘proof’, and that most people, including scientists, tend to use ‘evidence’ as a substitute for ‘proof’. This is how they got evolution accepted as genuine and authoritative, though, as one scientist once admitted in an annual Darwin lecture I once attended, “There is not enough evidence to fill one small room in support of evolution”. Or, to put it more succinctly, there is no proof at all. This is because ‘evidences’ are those bits of information one collects in the hope of reaching a position of forensic ‘proof’. But, evidences do not necessarily constitute proof. It is about time scientists were more honest. And used their own language more carefully. 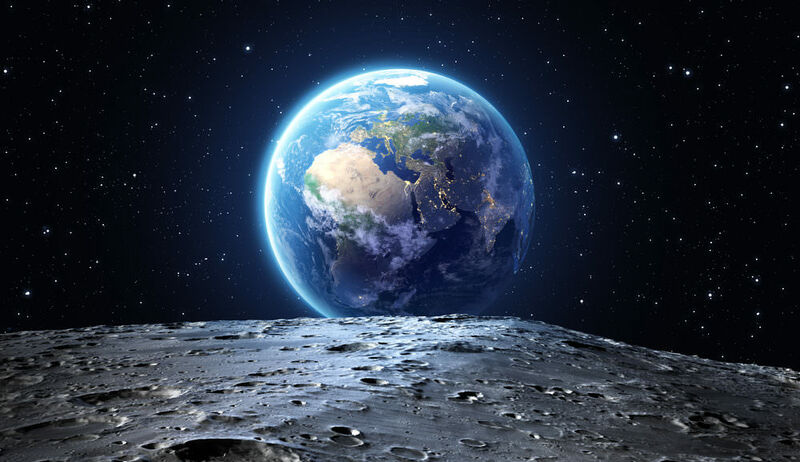 In the case of the moon, it is supposition that what the team found leads to a conclusion that the moon is the end result of a massive rock collision with the earth. Indeed, I would suggest that if the earth was hit by a rapidly moving rock half its size, that the earth would either have been blown up totally, or shifted to a position far from its present one. Students and observers must learn the use of language used by evolution scientists. They would find the language of possibilities and guesswork! The current ‘mystery is solved’ attitude should be challenged, because the evidences given are capable of more than one possible answer. As a Christian I know that the moon and sun were created deliberately, as we see them today, by God, a few days (literally) before He made Adam and Eve. They didn’t live under a massive dust cloud, but saw the sun and moon intact, already created. Everything else is fantasy. Of course, evolutionists would say MY statement is fantasy. The difference is that I am content for the statement to be made without freaking out. For genuine Christians this is sufficient, and I can predict that when creation scientists get through examining this latest ‘breakthrough’, they will obliterate it, showing it to be nothing more than another sign of evolution fairy-tale telling in an effort to maintain the evolution strangle-hold on society. Do I care if theistic or other evolutionists rant against what I have just said. Nope! I don’t give a fig! Hit me with a rock half my size, and I won’t budge. That’s because I don’t care a hoot about fake science or its habit of using school-yard tactics of belittling those they want to bully. Evolutionist scientists have a big blind spot. It’s called prejudice. It is a ridiculous belief that Christians are always wrong and their adherence to scriptural evidences are also wrong. Yet, their own evidences are always right, even when they are not. Once you get a possibility of other, alternative, conclusions, whatever is claimed cannot be considered any more potent than a mere hypothesis. And that is where we are at with the newest moon statements. I advise all Christians to get real. Learn the language of science. See what constitutes evidence and proof. Examine the language used and don’t be fobbed off with pseudo-scientific jabber that says a lot but means nothing. No scientist can ‘prove’ (and thus invent a ‘law’) anything from the past that has not been observed. The same rule applies to archaeologists, too, though, in the past hundred years or so, archaeology has been more honest than evolutionists, its work increasingly proving the Bible to be right. The current moon fable will no doubt be replaced in time by yet another fable. At the very most it is just an hypothesis, but a very tenuous one, because the elements that supposedly prove its case are capable of more than one alternative hypothesis. Though these projects are funded by NASA, it does not lend more credibility to the hypothesis, which has changed several times, as scientists change their minds! (NASA also funds global warming foolishness, though it is against science). The last idea was the ‘giant impact hypothesis’ – which at least did not claim a ‘theory’ status. (NASA.gov). The Smithsonian (smithsonianmag.com) thinks this latest hypothesis, already called a ‘new model’, will change views on the earth itself. It is thought gold and platinum are evidences that the earth was bombarded. But, why? No bombardment means they are part of the earth itself. Sadly, evolution scientists and those afraid that creation (and therefore God) is true, resort to babbling and shouting-down Christians who believe what the Bible says. But, we believe it because it makes far more sense than evolution (remember – no proofs whatever). The more they scream abuse the more we know they understand they are wrong. Maybe they need reassurance as human beings, perhaps a hug and “we love you to the moon and back”? The fact of their lack of confidence is in their refusal to allow any talk of creation into any sphere of science. Psychologically, this tells us a lot about their true beliefs. But, it also shows they have no real proof for evolution. So, go to it evolutionists… clobber away!